Are you looking for a copper outdoor fire pit? They do make a beautiful accessory on your patio. The Landmann copper fire pit is simple and attractive. The base is decorative wrought iron. The bowl is made of smooth copper. A black cooking grate sits inside. On top is a black screen to protect your surroundings from any flying embers and sparks. What makes this fire pit different is its screen. Instead of a door opening up or having to lift off the entire screen, this one has a handle that assists in sliding the screen to one side or the other. This copper outdoor fire pit is very attractive. As it ages, it even improves its look as the copper slowly turns to a beautiful verdigris hue (think of the Statue of Liberty). The base has a curled design that keeps the fire well above the ground. If you need to set it up on a surface that can't take the heat, it works well if you put down large ceramic tiles or some square concrete slabs to protect whatever is below the pit. This pit is very easy to assemble, too, making it a nice accessory to pack along to the lake, beach or campsite. It makes a wonderful place to gather round for roasting marshmallows, telling ghost stories late at night, or just to offer a little warmth on a cool evening. As you can see, the Landmann copper outdoor fire pit can really be a good investment in your outdoor entertaining. It offers you a beautiful piece for your patio. It is easy to assemble and move about. You can cook with it, keep yourself warm or just enjoy watching the flames dance. It is worth the cost because of its longevity. Knowing you don't need to replace it for several years really adds to its intrinsic value. The only real downside it has is if you are looking for a fire pit that allows you enough space to put your feet up on the rim; if so, this is not the model you're looking for. If that isn't an important feature for you, the copper really does look nice, both when you are using it as a fire pit and when it is left on its own. 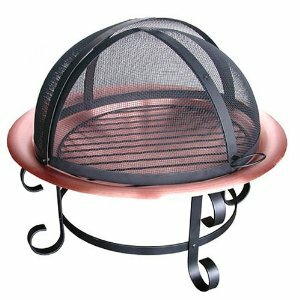 This fire pit would make an excellent housewarming gift for someone who loves to entertain. Even if they just like some quiet time on their own, the pit gives them a wonderful place to enjoy the changing seasons without worrying about getting chilled. In the summer, a cleaned out fire pit can easily be stocked with ice to hold cold beverages when you're entertaining. It can be hard to find such a versatile pit, but this one really does the job, looking great the entire time. Amazon carries this Landmann fire pit and offers free shipping with super saver shipping.